Was that brutal enough for you, Grey's Anatomy Fanatics? According to the official ABC promo, Grey's Anatomy Season 11 Episode 11 represented the reason why we watch Grey's Anatomy in the first place, a reference to the way this installment played with our emotions. We witnessed April and Jackson facing a difficult decision concerning their unborn baby, while Catherine ran into Richard at the hospital. 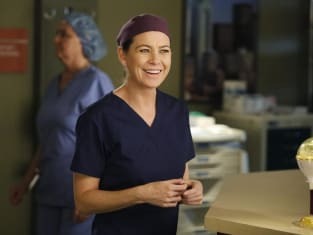 Elsewhere, Meredith searched for a babysitter so she could fly out and visit Derek; and Amelia attempted a tough love approach while working with Stephanie. Did it work? Sit back and watch Grey's Anatomy online now, but be warned: you WILL cry.